The Uzawa type algorithms have shown themselves to be competitive for solving large and sparse saddle point problems. They reduce the original problem to a lower-dimensional linear system and solve the derived equation instead. In this paper, we propose new Uzawa-MBB type and preconditioned Uzawa-MBB type algorithms for the nonsymmetric saddle point problems. 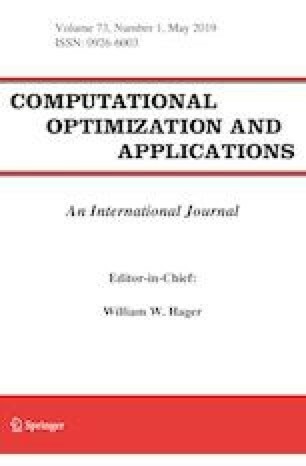 The main contributions of the paper are that both of the new algorithms are constructed from optimization algorithms, use a special descent direction based on Xu et al. (A new Uzawa-exact type algorithm for nonsymmetric saddle point problems, 2018. arXiv preprint arXiv:1802.04135 ), and combine the modified Barzilai–Borwein method with modified GLL line search strategy to solve the derived least squares problem. In addition, we analyze the convergence of the two new algorithms. Applications to finite element discretization of Navier–Stokes equation with an unstable pair of approximation spaces, i.e. Q1–P0 pair, are discussed and the results of the numerical experiments of applying our new algorithms are reported, which demonstrate the competitive performance of the preconditioned Uzawa-MBB type algorithms with Krylov subspace methods. The authors gratefully acknowledge the reviewers for their careful reading of the manuscript and insightful comments, which significantly improve the presentation of the paper, especially the numerical performance of the algorithms.